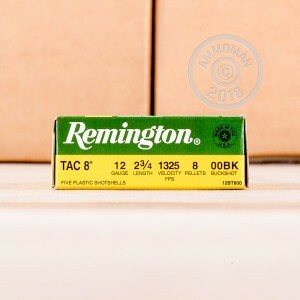 Remington Express Tac 8 ammunition is a powerful 12 gauge defensive load that produces hard-hitting results accompanied by relatively stout recoil. Each shell in this case of 250 fires 8 pellets of 00 buckshot at a muzzle velocity of 1,325 feet per second. 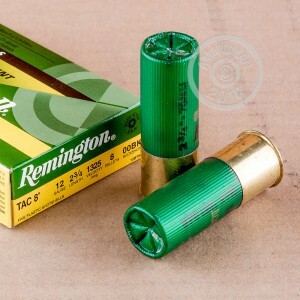 Remington's one piece Power Piston wad provides excellent patterning. These shells are sealed at the mouth and primer for better reliability. 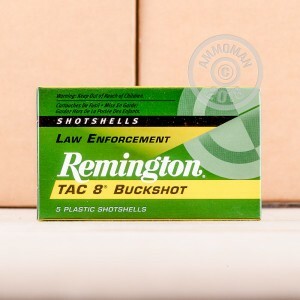 Like other Remington shotshells, they are loaded in Lonoke, Arkansas. Grab this case for some serious tactical training and save with free shipping from AmmoMan.com, as with all orders over $99.